>It’s 6:30 on Friday morning and Brenda, Rip and I are back in Wickford, RI. I left the office in a rush Thursday evening with the hope of arriving before dark. With the traffic we barely made it as it was pretty dusky when I got out to the mooring in the work skiff. 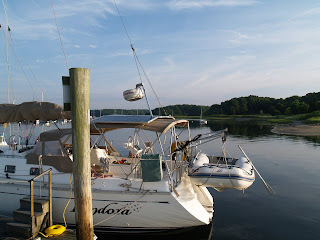 Our friend Eric at Pleasant Street Wharf told us we could put Pandora on the dock beginning on Thursday night until we leave to head out on Saturday afternoon. So, as soon as I was able to get out to Pandora, make way and get the fenders out, I moved her in to the dock. I was quick but it was dark by the time Brenda took the lines from me. Good thing that Mother Nature cooperated as a thunder storm hit about one hour after we came along side the dock. Is it possible to make it through a day without rain this summer? It doesn’t seem so. While the boat was a bit warm after being shut up for the week, we had a glass of wine and enjoyed the quiet of the harbor. This place is really beautiful so here’s the view of Pandora and the harbor today. The sunrise was really spectacular. Sorry, I didn’t have the presence of mind to take some photos until after my shower and a cup of coffee. Imagine these shots with more reds, oranges and yellows. You get the picture. Yes, I do want to live here! What a beautiful place. I will work this morning while Brenda’s out making the rounds followed by dinner out on Friday night and off to meet up with our friends on Firecracker, another SAGA 43. Let’s hope that the weather is OK. Who knows. I have to get to work so bye for now. 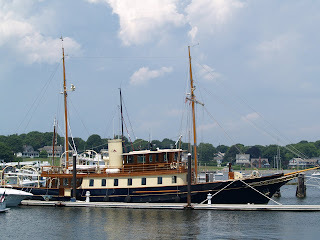 We have now moved Pandora to Narragansett Bay for the month of July. 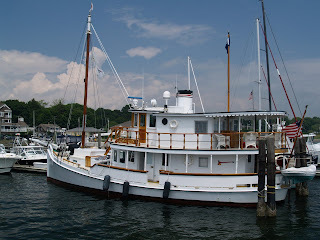 Our home port will be Wickford, a town that we would dearly love to move to eventually. Our good friend Eric Collins, with his brother Chris, runs a wonderful old time marina called Pleasant Street Wharf, a place that looks much like it did 50 years ago. Their website is in keeping with it’s laid back nature and is unpretentious as they are. Where else will you see cookouts every weekend where the owner is there drinking beer with the rest of the gang. And, if that’s not enough Eric has a beer tap in it’s own fridge (kegerator?) in the back of the shop so he, and his friends, will never be without a cold one. Eric’s wife Sandy is a real estate agent so perhaps she will sell us a house one day. 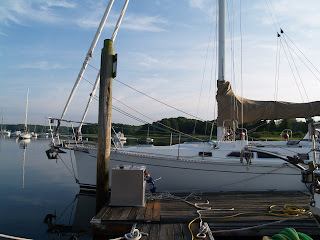 We will be making weekend trips from Wickford through July until we move Pandora to Maine in early August. 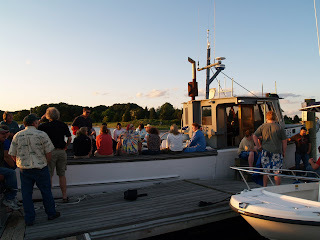 On the 4th we went out on Eric and Chris’s 40′ lobster boat to watch the fireworks. 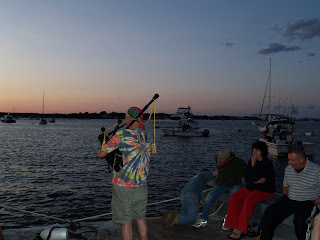 There was a wonderfully eclectic mix of folks on board including a tie died shirt clad bagpiper. That’s not something that you see every day. What a great time we had. We also went to Jamestown, right across from Newport but a lot less busy. We picked up a mooring in Dutch Harbor about a 3/4 mile walk on the other side of the island from town. 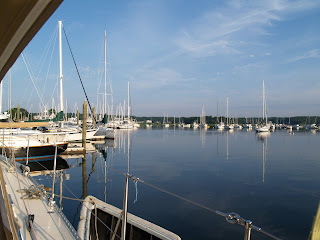 The harbor in Jamestown is fairly open to the east and the boat traffic kicks up a chop that makes the boats bob at their moorings and on the dock. 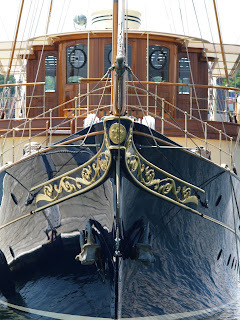 Never the less, there are a number of very nice boats on the waterfront. 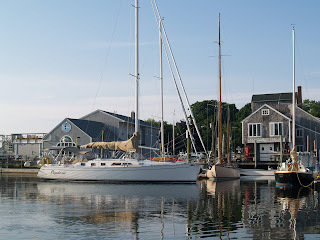 Two that really stand out are a small coastal cruiser that looks like it would be right at home on the Inter Coastal waterway headed to Florida for the winter. The real winner ihowever is this dark blue beauty. Who needs a mirror when you have the hull of this one to gaze into? What a stunner. It was built in Germany in the 40s. I wonder what sorts of stories it could tell? Not all the boats in Jamestown are big and shiny. 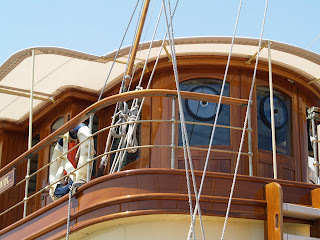 This massive wooden catboat Kathleen was built a few years ago by Beetle Boats and is ably sailed by her owner. Check out pictures of the build at their site. Last I heard, the boat didn’t even have an engine. 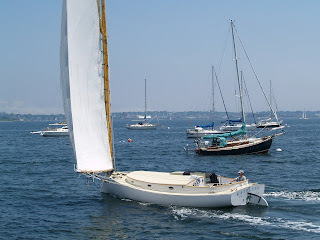 Well her sail is big enough to get her home in even the lightest breezes. It makes me wonder what he does when the wind really pipes up. Scary to think about. A few visitors aboard Pandora in Wickford. 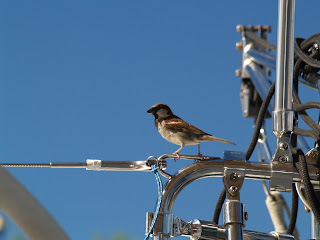 It was funny but this sparrow came back time and again over the weekend and made quite a racket. I wonder what he/she was looking for. On the other hand, our cocker spaniel Riptide knows exactly what he wants from us. 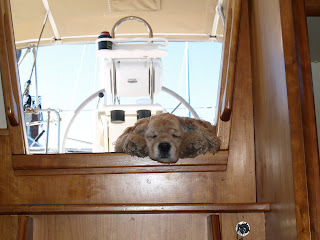 It’s a good nap and many runs ashore between meals. Not a bad life and what a great guy he is. Today I am writing this from Potter’s Cove across from Bristol where I spent last night with my friend Bryce. He sprung for a great load of lobsters, steamers, corn on the cob and massively large shrimp last night for dinner aboard. What a feast. hToday we are going to head 10 miles up the bay to Newport for a very different experience ashore. More to come on that.